We will pick you up from the airport and transport you to a hotel in the heart of the old quarter – great for taking in the heaving atmosphere that is Hanoi. The guide will offer advice and assistance on local cycle tour if you wish – otherwise take it easy. We will celebrate the first night with drinks and a very special local Hanoi dish of Cha Ca La Vong. Overnight at hotel in Hanoi. 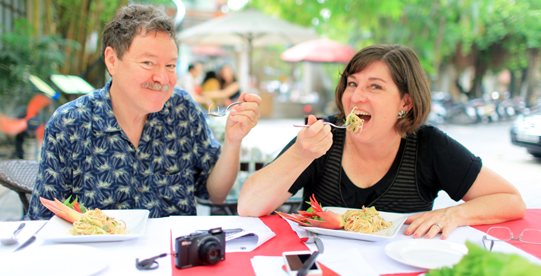 Day 2 Hanoi highlights exploration – Hand-on cooking class – Street food taste. How Hanoi people enjoy breakfast?! You will be among of them to have breakfast today before visit some the city’s highlights and take part in great hand-on cooking class. 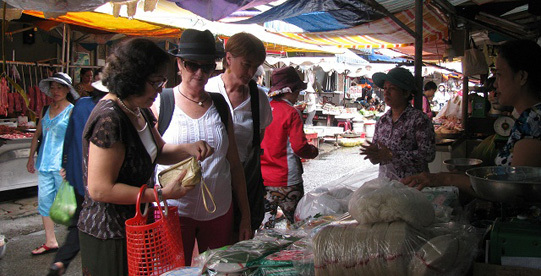 Your cooking class begins by visiting the bustling local market to learn about the ingredients and the culinary culture of Vietnam. Chefs will help you choose some fresh ingredients to serve your course. Return to cooking center, under the guidance of talented chefs, you will learn how to cook three Vietnam foods. This is time for you learning from expert’s tips to preparing delicious food, make friends, cultural exchange and of course enjoy great food that you have cooked. 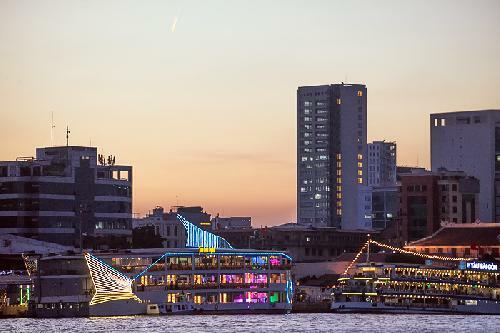 Finish your cooking class, we will continue to discover Hanoi’s highlights, including Literature of Temple, Ho Chi Minh complex, Old Quarter, French Quarter….Stop to admire peaceful sunset from the 100-year-old bridge, crossing the Red River. That is moment to soak up the sights, sounds, and smells of Hanoi. Transportation: Car & Xich Lo cycle. Have breakfast at the hotel then depart to Ha Long Bay with short break on way. Embark the junk on arrival with welcome drink. The board start cruise around thousand limestone monolithic islands, each topped with thick jungle vegetation, which rises spectacularly from the ocean while enjoying your lunch. Afternoon, it is time for your choice: swimming, kayaking, explore the most amazing bay by catamaran or simply laze on board the boat. Demonstration dinner today on board must be interesting. 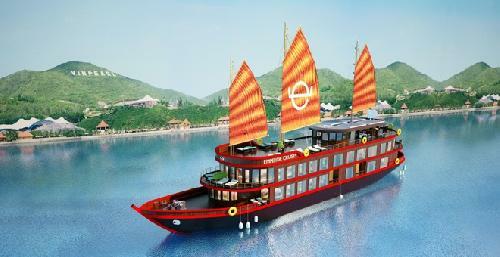 Enjoy light breakfast on board then visit Amazing cave – the biggest and most beautiful one in Ha Long Bay. Stroll nearly one hour in the cave to explore the glittering stalactites with ample countless shapes, unleash your imagination. Return to your junk where brunch is ready for your appetite whiles cruising toward the habour. Disembark the junk, drive direct to Hanoi airport, catch flight to Da Nang. 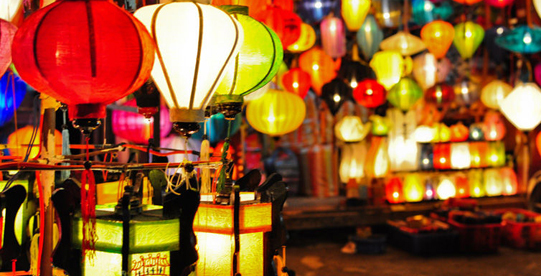 Warmly welcome on arrival Da Nang airport, transfer to Hoi An ancient town for check in and relax. 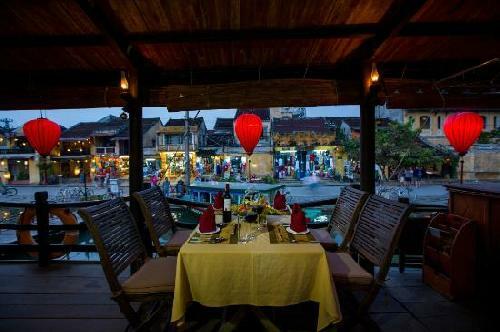 Your dinner today is Hoi An specialties at cozy local restaurant. Enjoy breakfast at your hotel then take a half-day cycling and hand-on cooking tour. This class designed for those wanting a practical, hands-on, gourmet experience. The tour start with biking to the herb gardens of Tra Que Village and a talk on the art of Vietnamese gastronomy, vegetables, herbs & spices and how to prepare and use them. The practical session comprises cooking & cutting techniques. The recipes are provided for you to take home. Afternoon, you are free to grab a bike and explore, get shoes made, dresses, suits or to just relax with a book. After exciting exploration, now is time to feasts dinner on the boat while cruising in marvellous sunset. Breakfast at your hotel then take flight to Ho Chi Minh City. Check in hotel and free at your leisure. 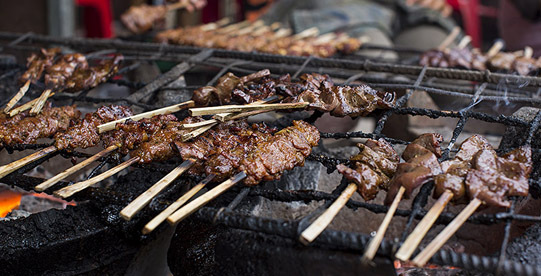 Late afternoon, experience the authentic Saigon cuisine with foodie adventure. It is a uniquely chance to discover reality Saigon at night with wide selection of amazing food. Skip repeated breakfast at hotel; we enjoy breakfast in the local way - a great starting a day of exploring the exciting city. We then visit a “friend's house” - where the typical female Vietnam, resourceful, tender and well cooking living with her happy family. You will surely be warmly welcomed and immersed in cozy atmosphere, among friendly people when you stroll in local market with her, meet, talk to vendors, neighbors… Together with her, you will cook and enjoy the lunch with her family. 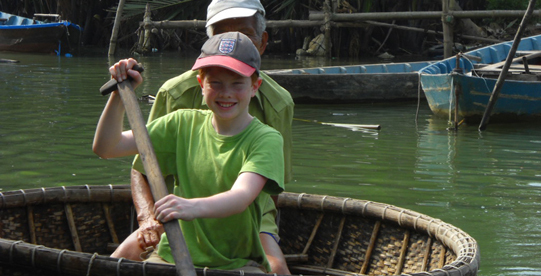 The sincerity and warmth from local people make your trip remarkable. Return city center, we spend the rest of day discover the city’s best attractions, including Reunification Palace, Notre Dame Cathedral, the General Post office, Jade Imperial pagoda…. Dinner is free as your own choice. This day is free at your leisure or shopping and discovering until transfer to the airport to catch your flight home. Any services not mentions in the included portion. Deposit and Payment: 30% of total invoice should be deposit at the time of booking for guarantee. Final payment is no later than 7days in advance of arrival date. Cancellation: If cancelling less than 15 days, the deposit is non-refundable. After final payment is received a cancellation fee of approximately 75% applies. This percentage may be less depending on the date of cancellation. A cancellation fee of 100% is applicable within 03 days of travel. Pricing: All prices are shown in American dollars and are current at the date of printing this itinerary. If there is a dramatic fluctuation in the exchange rate or the price of services provided, which are beyond the control of Vietnam Food Tour, VFT reserves the right to adjust tour prices accordingly, even though the balance of payment may have been made. This would only happen in unusual circumstances. Itinerary Validity and Content: This itinerary is valid until 2015, unless otherwise specified. Every effort has been made to ensure accuracy. 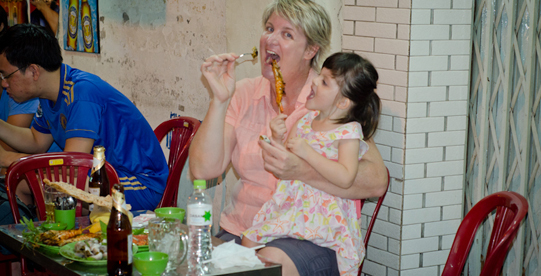 Vietnam Food Tour shall not be liable for any injury, damage or loss caused by any inaccuracy. 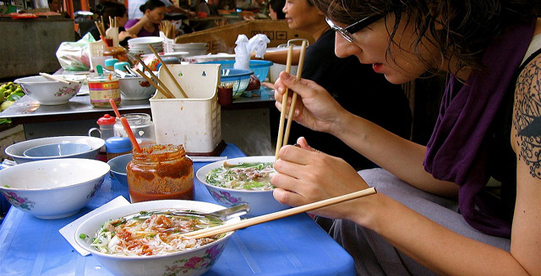 Vietnam Food Tour reserves the right to change tour arrangements or accommodations due to safety or security reasons, and will endeavor to provide alternative arrangements of the same standard as that originally booked. Special Requirements: Please advise Vietnam Food Tour of any special requirements such as Special Meals, Medical Requirements etc., as soon as possible. If you get motion sickness, it is imperative that you bring with you motion sickness pills as we travel by coach and boat sometimes in our tour. Travel Insurance: We strongly recommend you organize travel insurance before departure in your country. Insurance covers cancellation fees payable for airline tickets, accommodation, loss of deposit, luggage etc. Clients’ Responsibilities: It is your responsibility to obtain passports, health certificates or other travel documents where required for the tour. It remains your responsibility to ensure that these documents are in order and to meet any additional costs incurred as a result of failure to comply with such requirements. It is also your responsibility to obtain any vaccinations that may be required to travel.